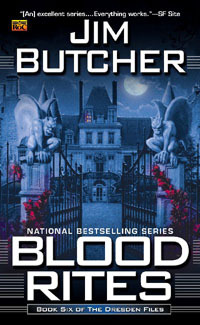 The next one up is part of the Dresden Files. This series, when I started it, I was not particularity sold on. Storm Front, the first book, did not really impress me that much. The story was ok, but the humor that Dresden uses is just terrible. I was amused enough to try the second, and I was glad I did. The series gets better–much, much better. I did not “read” this one. I actually listened to it on the way to work. This was my first audio book in years. More than 20 I would have to venture. The experience was ok. I must say, I was not really as invested in this book as I would have if I had read it personally. The narration was good (James Marsters of Buffy fame), but his Dresden was not my Dresden. I will try audio books again, but the actual act of reading I find more pleasurable. Blood Rites may be my least favorite of the Dresden novels. I did not find it all the good or compelling–at least its main storyline. The incidentals, the portions that expand the Dresden backstory and flesh out the world, now that was good. In this one we learn a lot about Dresden personally and the people around him. It is an important book in the overall arc. Which is really too bad as the story in this one is weak. The signature Dresden “humor” is just terrible. Butcher really should just stop with his humor. It is rarely funny, and I understand what he is trying to do, but he fails so miserably at times, and in this one, oh it is so terrible. If Blood Rites was the second book in the series, I would have stopped reading. This is not a good one. It is ok at best. Luckily, I have read 3 others that I have quite enjoyed with the fourth one, Summer Knight, being my favorite. What I find that I like about Harry Dresden is that he is a good guy who tries to do his best to do the right things. They may not be the best things, but they are always what a good person would do. It is refreshing to have a hero who is not flawed, who is not brooding, who doesn’t always fail, who is often incompetent. I find it very refreshing to read a story about a good guy who is very good at we does. I look forward to the next one whenever I get around to reading it. This entry was posted in Reading and tagged jim butcher, reading, urban fantasy. Bookmark the permalink.